In times of old, people would make pilgrimages to Jerusalem to walk and pray in the places Jesus lived the last days of his life - to follow his footsteps. As Christianity spread and people could not make pilgrimages to Jerusalem, the prayer practice of Stations of the Cross developed. Instead of physically journeying to Jerusalem, stations were set up in local churches with artwork and sculptures depicting scenes of Jesus’ journey to the cross. The classic version of this popular prayer walk consists of a series of 14 meditations on Jesus’ final hours. A person or group “makes the stations” by walking to each sequential station for prayer and meditation about the event that the station symbolizes. 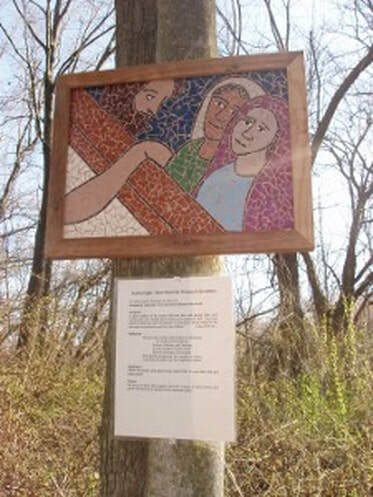 Our mosaic tile stations, created by local artist John Nafziger and Walnut Hill Mennonite Church, were first displayed in 2007 along the wooded trail at Pathways. This walk through the woods to contemplate Jesus’ journey to the cross appeals to all ages—children, youth, and adults. Each station includes scripture and written reflections to guide you. Come during daylight hours. A golf cart is available making this prayer walk accessible for people of most ages and physical abilities; please make arrangements for the golf cart prior to your arrival by contacting us. Dawn-Dusk. There is no charge though donations are always gratefully accepted.